"Aside from his personal qualities, jazz musicians respect the fact that down inside, Ray Charles is an excellent musician himself. He knows everything that's going on." Ray Charles was born in Albany, Georgia, in 1932. At the age of six, living in Greenville, Florida, he went blind. He was enrolled in a state school for the blind at St. Augustine, Florida, where he first began to study piano by Braille. By the time he was seventeen, both his parents were dead and Ray was a thoroughly accredited professional, playing with everything from rhythm-and-blues groups to hillbilly bands. He played both piano and alto sax, and in 1948, wound up in Seattle, Washington, with a trio. It was in Seattle that he met Quincy Jones. The group Charles had at the time was called the McSon Trio [via spelling errors, it was listed on record labels as, variously, the Maxine Trio or the Maxim Trio], a Nat Cole / Charles Brown style trio. The next few years were spent trying to make tow dollars, and he was fairly successful locally. He worked with Bumps Blackwell, and made a record for a small California label, Swingtime, called "Baby Let Me Hold Your Hand." In the limited field of rhythm-and-blues he had a hit, and one of those who heard it was Ahmet Ertegun of Atlantic Records who promptly bought his contract from Swingtime. On those early records for Atlantic, whether consciously or not, Charles had worked out a fusion of styles that would make him one of the most popular entertainers in the world. The great early Charles records were based on blues and gospel forms. The lyrics were concise, full of sharp psychological truth, and, for the most part, conspicuously lacking in the self-pity that is the stock-in-trade of most popular songs. Such performances as "A Fool For You," "Drown In My Own Tears," "Hallelujah I Love Her So," "I Got A Woman," "This Little Girl Of Mine," and "I Want A Little Girl," initially released as single records on Atlantic, consititute the nucleus of Charles' achievement. Atlantic also began to release instrumental sets. Even though Charles is capable of accurate self-appraisal ("Four pianists influenced me most when I was a kid learning how to play the piano: Art Tatum, Bud Powell, Nat Cole, and Oscar Peterson"), he was reluctant, according to Ahmet Ertegun, to make straight jazz instrumental recordings, although they have, in the main, been quite successful. 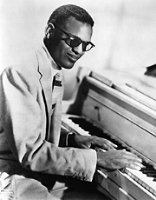 The first, The Great Ray Charles, revealed that he is a fine blues pianist with an excellent small band, featuring saxophonists David Newman and Hank Crawford, and trumpeter Marcus Belgrave. This band, the favorite of Art Blakey, among others, plays in the same general "soul" category as Blakey or Horace Silver, but leans more to overt use of gospel forms. His touching piano solo, "Sweet Sixteen Bars," is simply an instrumental version of "A Fool For You." Nesuhi Ertegun, Ahmet's brother and partner, reports that "Jazz musicians were the first to hear about him. Five and six years ago, people like Miles Davis and Dizzy Gillespie would always ask about him, did he have a new record coming out, and where was he playing. I don't know if they bought those records, but they knew every note by heart, and could play all the riffs." But at that same time, if one called a jazz disc jockey like Symphony Sid to request a Charles record, the answer would be, "We don't play rock-and-roll." What freed Charles from such pigeon-holing was the release of his Atlantic recording, The Genius of Ray Charles. The musicians on one of the two sessions in the album included top men from the Ellington and Basie bands--such men as Clark Terry, Joe Newman, Frank Wess, Freddie Greene, Quentin Jackson, Al Gray, plus other jazzmen like Zoot Sims and Charlie Persip. The other session, arranged by Ralph Burns, featured strings and a vocal chorus. Whether or not the strings were apt, whether or not the Erteguns had to convince Charles to make such a record, it was a certainty that a jazz singer of great depth and importance had finally arrived. Even Symphony Sid made a shift of position and began calling Charles "Mr. Soul." A selected discography of Ray Charles albums. The Great Ray Charles, 1957, Atlantic. Soul Meeting (w/ Milt Jackson), 1958, Atlantic. The Genius of Ray Charles, 1959, Atlantic. The Genius After Hours, 1961, Atlantic. Ray Charles at Newport, 1961, Atlantic. Blues + Jazz, 1957-61, Rhino. Genius + Soul = Jazz, 1961, Impulse. My Kind of Jazz, 1970, Tangerine.